Ms. Armstrong is at the same time, a traditional wisdom keeper for the Okanagan People, especially the Penticton Band where she lives and teaches the wisdom of Indigenous economics centering upon restoration and conservation. She is one of the last native speakers of her language and has created a center to re-teach her people in the Okanagan, the language that has been with them for generation after generation.Film recording and complete transcript with slides is freely available. Summary excerpts follow. My name. There I am with my daughter. My daughter’s name is Her Power Is Water, sumaxatkʷ. My name is The Sound And Sparkle Of A Small Brook Rushing Along, laxx̌laxx̌tkʷ. Behind and surrounding us, embracing us, is our Grandmother. 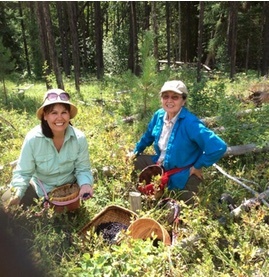 Our Grandmother who gifts us with the beautiful berries and the precious cedar baskets that take a year to make. I have been a resister and an activist, as that is also needed in order to defend. But today I share my indigenous work here from my home. This place is the multiversity of my people which gave me my true Ph.D. My other Ph.D. is from university in environmental ethics. The Ph.D. is a way to look at, and share something, of my Grandmother’s wisdom through that lens. The point to me seems obvious, that the root of today’s problem is how humans chose to live insulated from nature’s mediation of their behavior within a system of reciprocities in which everything that takes must also give. I can also see that it has something to do with a belief, a belief in ever increasing the insulation from nature’s economic requirements of us as humans in the way we are. This is my brother, Richard. He didn’t go to university. He went to Grandmother’s University. This is my brother training ecologists and environmentalists and biologists in our lands economics. In doing restoration and conservation, they need to know the land’s requirements of us all. And that many of its beings on those lands have included us humans in their reciprocity and need humans to take their gifts. And that the grasses and the great herds have included us and other animals in their reciprocity. Learning that way so we stay a part of that reciprocity. My brother here is providing some ideas. It is a framework of economic principles. That is my extended family’s children. That is my nephew and myself working with children. And so one of the things that I have come to understand is that in maintaining those economic principles, is that we have to pass them on. Indigenous economics is a lived experience. We are socialized into that lived experience. It’s not something we can learn about from a book or something we can learn about from a far distance from what we need in our lives. This is one of the boys in our puberty training. He is learning how the deer gives to us. He must do a gratitude ceremony to release the deer’s spirit to rejuvenate itself. That way he never allows himself to kill the deer’s ability to fully regenerate its kind. So it will always be there to give us its gift of its life as food. He is recognizing through our human spirit the spirit of the lives that embrace us. These are children in my extended family. They are learning to love the taste of Grandmother’s gifts and the pleasure of harvesting it together, and to hear the songs of its celebration. Also to give thanks and to love to work slowly and hard picking reverently each berry. Whether they are trees for baskets or deer for food, to kill means taking until they cannot regenerate and they disappear. The laws of this is that it is nature’s requirements of us, to know those limits. To know its reciprocity as a human love for these relatives. This is a human responsibility in terms of our reciprocity. These are the local people of both indigenous and non-indigenous heritage at En’owkin’s riparian forest restoration place. We rescued it from becoming a golf course. We turn to the community of the local cities and the local reservations. We turn them into a force to protect it, to increase its reciprocity. We bring people to love it. The school’s children in all the surrounding towns come. Adults learning ecological restoration and those who just need to rest and heal come to learn about it. To learn about the ecological knowledge from our point of view, from the Syilx point of view, as a collaborative force and a collaborative voice in re-indiginizing the place. However, we can’t eat them now. The Okanagan Lake is being poisoned with effluent and agricultural and orchard pesticides and so we stopped eating them. But we do not stop going there to greet them, to give them offerings and to sing to them and to make a feast of giving to those who come to join in. We love them and they loved us. For too many years they loved us, for us to forget them. It is one of the most beautiful ceremonies that our people did. This was the first Salmon release ceremony about 17 years ago. Since then, it’s just grown so huge that many, many people can’t fit into that small area. These are my relatives, my grand daughter and my nieces and they’re preparing the salmon. The happiness that it brings is in the faces of my niece and my granddaughter. The taking care of the salmon in the right way is spirituality. Belonging to nature’s reciprocity, here in this beautiful land and its diverse places. The longing to be a part of nature must end, and belonging must happen. It must happen in a good way. So I will leave you now, with the contemplation of re-indigenization in this last slide as I walk back to my seat. Contemplation on how it transforms people to the land’s spirit. The Turtle came up from the deep dark and grasped onto the land’s edge. I pray for that for everyone here. I give my medicine to you.